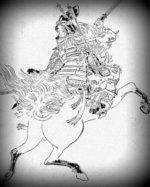 As well as being a great warrior and writer, Miyamoto Musashi was also a renowned painter. As an artist of suiboku-ga, or sumi-e, (monochrome ink painting), Musashi painted much how he fought, with a powerful and direct style that utilized a remarkable economy of movement. Of particular note were his paintings of birds such as Koboku Meikakuzu (Shrike Perched in a Dead Tree) and Rozanzu (Wild Geese among Reeds), and a famous self-portrait he did in c.1640 (pictured right). Musashi rarely washed as he believed the act of bathing put him in a vulnerable position and unlike most samurai warriors, he dressed in rags. It can be argued that this tramp-like appearance served to anger his opponents who would have seen it as disrespectful to turn up to face them in such a manner. Others would have underestimate him because of his appearance, either of which would have had a negative effect on their ability to fight to their maximum potential. 1. Do not harbour sinister designs. Think honestly and truthfully. 2. The Way is in training. One must continue to train. 3. Cultivate a wide range of interests in the ten skills and ten arts. Then one can definitely find the benefits of hyoho and develop oneself. 4. Be knowledgeable in a variety of occupations, and learn the thinking of people who work in them. 5. Know the difference between loss and gain in worldly matters. 6. Nurture the ability to perceive the truth in all matters. It is important to build up an intuitive judgement and understand true values. 7. Be aware of those things which cannot be easily seen with the eye. Develop intuitive judgement and a mind that freely controls one's body. 8. Do not be negligent, but pay attention even to the smallest details. Keep them in mind all the time, so as to avoid unexpected failure. 9. Do not engage in useless activity. Do not argue about useless things. Concentrate on your duties. Shinmen Musashi no Kami Fujiwara no Genshin, better known as Miyamoto Musashi is probably the most famous historical samurai today as a result of his highly acclaimed martial arts text, The Book of Five Rings. His story has been told and retold down the ages and many of his ideas on fighting technique and strategy have become commonplace amongst warriors as a result of his teachings. He claimed to have fought in over sixty duels between c.1604 – 1613, despatching all who stood in his way and building a reputation for himself as the finest swordsman in the country. Born in 1584 in Miyamoto village, much of the detail about Musashi’s childhood is obscure however it is known that he was born into a samurai family and probably grew up with his mother or step mother. 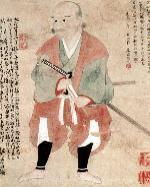 His father, Shinmen Munisai, was an accomplished warrior who would regularly visited his son and give him instruction on swordsmanship and other aspects of samurai culture. However by the time he was around 10 years old, Musashi’s mother was dead and his father had either died also or completely abandoned him, so he found himself living in a monastery where he learned Zen Buddhism from the monks there. At the age of 13 he was already confident enough to challenge an older samurai named Arima Kibie of the Shinto Ryu (school). Arima made the mistake of disrespecting Musashi by treating him like a child, which resulted in Musashi throwing him on the floor and beating him with a six foot wooden staff until his opponent died vomiting blood. At 16 Musashi left the monastery and it would not be long before he found himself fighting his second duel, which he won easily. Soon after he would face a tougher challenge when he fought in the Battle of Sekigakarai (1600) on the side of the Ashikaga Clan against the victorious army of Ieyasu Tokugawa. Despite being on the losing side, he fought bravely and somehow managed to survive both the battle and the ensuing massacre of Ashikaga troops that followed it. 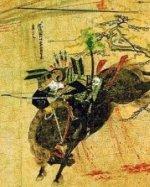 The aftermath of the Battle of Sekigakarai left Miyamoto Musashi in the position of being a master-less samurai (known as a ronin) so he began to wander Japan on a type of warrior pilgrimage known as a musha shugyo. During these years, he would hone his fighting skills and philosophy in a series of duels, many of which were to the death. Seijuro Yoshioka – This duel was fought with bokken (wooden sword) and like many instances of one-on-one combat at the time, was not meant to be to the death. Both warriors agreed beforehand that the winner would be declared by a single blow which was promptly administered by Musashi, who broke Seijuro’s arm in the process. After the battle, Seijuro retired from his position as head of the Yoshioka Ryu and became a Zen monk. 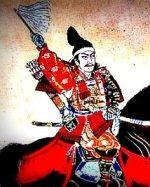 Denshichiro Yoshioka – As the brother of Seijuro, Denshichiro became the head of the family and soon challenged Musashi in order to regain honour for his family name. This time the duel would be to the death and as was his custom, Musashi turned up late in order to get his opponent angry, a tactic that worked well on both the Yoshioka brothers. Fighting again with a bokken, Musashi won the fight easily, killing his opponent instantly with a head blow and leaving the reputation of the Yoshioka Ryu in ruins. Matashichiro Yoshioka – The new head of the Yoshioka Clan was a 12 year old named Matashichiro, who also challenged the warrior who had brought dishonour to his family. As the time requested for the fight was at night, Musashi became suspicious that foul play was afoot so he turned up early and hid himself from sight. Sure enough, when the boy arrived he had a retinue of men armed with swords, bows and rifles who all found a hiding place intending to ambush Musashi while Matashichiro acted as bait. When the time was right, Musashi charged the young warrior and cut his head clean off. Surrounded by the boy’s retinue, he then drew his second sword and cut himself a path through the men trying to kill him before escaping into nearby rice fields. This not only ended the Yoshioka Ryu, but was also a pivotal moment for Musashi according to many historians as it is believed that it was his first conception of fighting with two swords, a style that would become his trade mark in later years. The most famous duel Miyamoto Musashi fought while on his musha shugyo was against Sasaki Kojiro in 1612, who at the time was the Shogun’s martial arts teacher and the most feared and respected warrior in the land. Kojiro was seen as the ideal warrior who looked and acted the part of the samurai as laid out in the bushido code to a tee. Musashi on the other hand was the complete opposite who was less concerned with his image or how society perceived him and more concerned with beating anyone who faced him in battle. The two agreed to meet on an island and unsurprisingly Kojiro turned up in a timely manner, sporting the best clothes and swords money could buy. Musashi however made his opponent wait knowing that his turning up late would anger him, thus having a negative effect on his concentration and focus; Kojiro’s anger would have only increased when his opponent did finally arrive sporting his usual dirty rags instead of attire befitting a man of their social class. 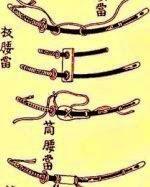 Kojiro had his swords made just a little longer than the average sword length to give himself reach advantage over his opponents however it seems Musashi knew this and devised a strategy to combat it. It is believed that he fought with a bokken that he fashioned out of an oar on the boat ride to the island, making it longer than his opponent’s sword in order to beat him at his own game. When the fight began, the two moved to attack simultaneously and Musashi’s reach advantage showed through from the start as while Kojiro managed to cut a nick in Musashi’s clothes, he himself was cut in the head. The two great samurai warriors moved towards each other for a second attack and once again Kojiro could only cut his opponent’s clothes while the extra few inches of the bokken allowed Musashi to cut his opponent’s throat, killing him instantly. In other versions of the story, Musashi uses two sticks to defeat his enemy and in others still he wins the fight with two swords (as depicted below). 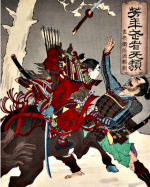 In 1614, Musashi once again found himself at war and again is believed to have sided against Ieyasu Tokugawa, this time in favour of Toyotomi Hideyoshi. Both winter and summer battles were fought at Osaka and Musashi was on the losing side once more, though some believe he switched allegiances before the end of the conflict. After Osaka, Musashi spent a number of years teaching his sword skills until in 1620, he decided to undertake another musha shugyo, this time less to fight and test his abilities, and more to learn and develop his skills. During this time the master did partake in a number of duels, he won all of them though none of them were to the death. By 1640, Musashi had become the retainer of Hosokawa Tadatoshi, Lord of Kumamoto for whom he would write his first book, the Hyoho Sanju Go (The Thirty-Five Instructions on Strategy). Two or three years later, the samurai became sick and sensing that his end was near, he retired to a cave where he would write his masterpiece, Go Rin No Sho (The Book of Five Rings). While in the cave, he also managed to write a book on self-discipline called Dokkodo (The Way of Walking Alone), which he completed in 1645, just months before he died. The influence of Miyamoto Musashi on future generations of martial artists cannot be overstated. 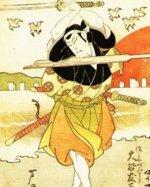 He became known in Japan as a kensai (sword saint) and many see him as the greatest swordsman that ever lived. While this is debatable, his skill with the pen has insured that his legend lives on and his main work, The Book of Five Rings, is today studied as a guide for strategy all over the world by martial artists and non-martial artists alike. Cook, H. 1993. Samurai – The Story of a Warrior Tradition. London. Blandford Press. Evangelista, N. F. [Internet]. 2014. Miyamoto Musashi. Encyclopedia Britannica. 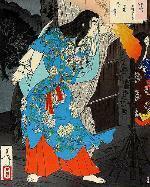 Available from: http://www.britannica.com/EBchecked/topic/386504/Miyamoto-Musashi [Accessed June 26, 2014]. Musashi, M. [Internet]. c.1643. The Book of Five Rings. Bookoffiverings.com. Available from: http://wwwbookoffiverings.com [Accessed June 26, 2014]. 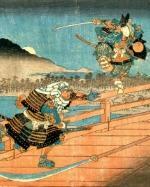 Musashi Miyamoto – The Life and Tales of Japan’s Greatest Swordsman. [Internet]. 2014. Japan Network. Available from: http://www.musashi-miyamoto.com [Accessed June 26, 2014]. Turnbull, S. R. 1989. 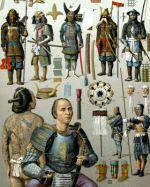 Samurai Warlords – The Book of the Daimyo. London. Blandford Press.